Officially, our lodge was founded on May 11, 1949, when our first charter application was accepted by the national office. But like most lodges there is more to the story than just that event. Tentative steps were taken when a team from Caddo Council in Texarkana, TX, headed by Scout Executive Bob Lundquist, visited Cedar Valley to introduce the OA to us. 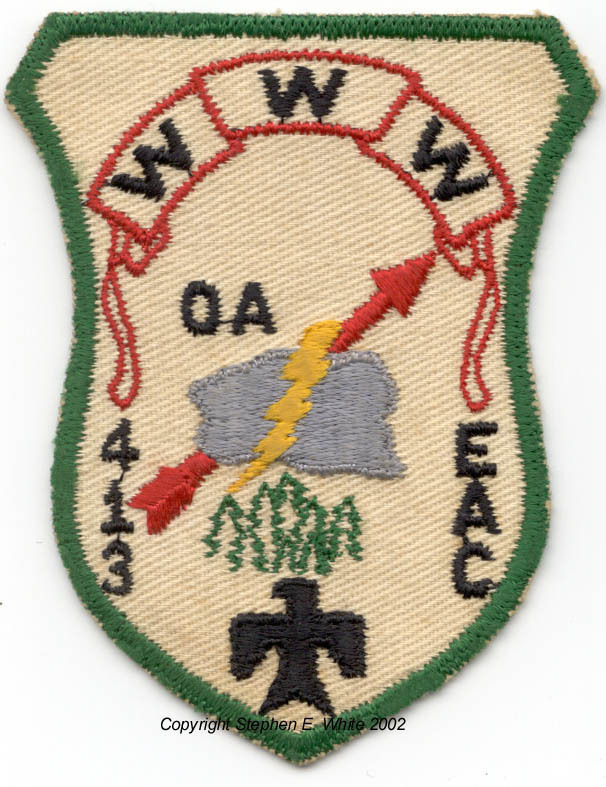 In 1948, the Order of the Arrow was fully integrated into the Boy Scout program. While many council camps had previously formed non-OA camper honor groups, there is no evidence that Camp Cedar Valley or any of our prior camping programs had an "honor camper" recognition. With the 1948 action of the National BSA, EAAC become actively interested in introducing this 'new' program to our scouts. Fortunately for us, a young man named Leonard 'Jack' Roy, had been inducted into the OA in El Dorado, Arkansas, and was an active district executive with DeSoto Council. Jack was excited at the idea of building a lodge from scratch and moved his young family to Jonesboro, Arkansas, to begin this new endevor, late in 1948. 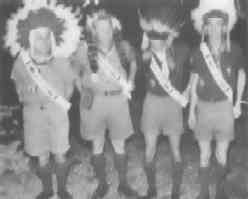 Jack believed that to be successful, the Order of the Arrow required leadership from the scouts themselves rather than just the adult leaders. Rather than immediately request a charter, he took time to identify young men with leadership potential who in turn could begin the planning process while Jack exposed them to the purpose of the OA. Quickly, people like Don Hearn, Charles Frierson III, Wells Duncan, Watt Campbell, and George Roberson stepped forward. Others whose names have escaped us, together with these individuals, worked quickly to establish our lodge. While our charter was granted only weeks before the beginning of summer camp, our first inductions of Ordeal members still were able to occur that first summer of 1949. The first tapout was conducted at the old Cedar Valley waterfront. From a small island near mid-river, a chief would appear. Descending from Council Bluff, a runner with a torch then appeared who actually did the tapout of candidates. Fragmentary records seem to indicate 58 scouts were inducted in this manner. Legend also surrounds our early 'shield' patch and generic design. All the designs contained five small cedar trees. Many of our camp patches from the period through the 1970s also contained the same five small trees. The story is that there were five youth who formed the core of the group of our founders with Jack Roy as the adult leadership. The legend contends that the five small trees represent the five young 'seedlings' of our lodge. In the early 1950s, the lodge grew slowly. All of our early members drew from the camp staff and some long-time adult leaders. In 1952, our first non-camp staff troop elections to the order occurred. The summer of 1953 marked our first Brotherhood inductions of a number of youth and adults. There was a strong interest in the 'Indian lore' aspect of the OA during summer camp, but our members had limited knowledge and resources. We learned a lot from our friends at the nearby camp Kia Kima. But we wanted more realistic and accurate representation in both costume and dance. During 1952 Jack Roy hired two Native American teenagers from the Tahlequah, Oklahoma area, to spend the summer at Cedar Valley teaching our scouts the proper techniques. The younger lad named Robert Pewo was very popular with the scouts. Robert possessed great skill in dancing and teaching others the techniques of costume construction. Don Hearn in particular quickly developed skills under Robert's instruction. Don in turn quickly moved to help build our first true dance team, and pushed others toward costume construction. Our early traditions in dance trace their roots to this unnamed Native American, to whom we will always be greatful, and Don. From this foundation, in 1958 Rick Duschl became involved and significantly expanded the Indian Lore focus of our lodge. In the spring of 1956, lodge 413 elected our first members of the Vigil Honor. In recognition of their service, Jack Roy, Watt Campbell, Don Hearn and Sonny Roberson, traveled to Camp Currier, near Memphis, Tennessee, to be inducted by Vigil members of their lodge. Moments after their induction, the photo to the left was snapped, reflecting four very happy men. The next year, James Rose was inducted into the Vigil. There would be no other Vigil inductions until 1961, in part because of the importance we place upon the Vigil. From the strong influence and guidance of these first Vigils, the importance we place on elevation to the Vigil Honor continues even today. Nomination is seriously considered, and it is not unusual to elect fewer new Vigils than the national quota would otherwise allow. By 1960, the OA was spreading in our council. Chapters were beginning to form parallel to our districts. Active interest in Indian Lore grew as did our knowledge of correct costuming and style. A new generation of scouts, raised in the budding traditions of Cedar Valley and our lodge were coming of age and the leadership of our group passed from the founding youth to young men like Frederick 'Rick' Duschl, Vance Blackwell, E.C. Clifton and David Lyttle. 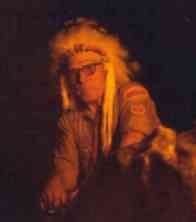 Rick and others ensured that Indian Lore remained a central part of our focus together with service and camping. During the mid-1960s our camp moved from Hardy, Arkansas, to our present home near Viola, Arkansas. The dedication of our OA members was present even then, when it was stipulated in the contract to sell the old camp, that the site of our old ceremonial circle never be developed, but remain a wooded peaceful location. The members worked many hours to ensure that every element of the ceremonial site was moved to the new camp where they are maintained to this day. Tragedy struck us twice in the late 1960s. First, with the death of Rick Taylor of Osceola, Arkansas, killed in action in Vietnam. Later, Rick Duschl (at left in his youth) was killed in a car accident near Viola after a brief visit with old friends at Camp Cedar Valley. Both events profoundly effected our members, and lead to their being memorialized by having, respectively, the camp health lodge and camp OA lodge/museum named in their honor. In November 1966, we held our first Fall Fellowship, intended to be our annual purely social / entertainment event. We also introduced our first quarterly lodge newsletter, The Legend earlier that same year. By 1970, our lodge had grown substancially in size to match the growth of our council. Changes to Ordeal election procedures introduced by the National BSA in 1970 further increased our membership to record levels. 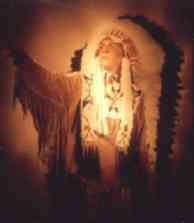 The early youth of our founding years were grown men and a second generation of arrowmen had moved to young adulthood. Yet another generation of young men was coming of age as our 100th Vigil was inducted in 1975. During the mid-1970s new traditions were introduced such as the symbolic large red candle (1974) used in opening our meetings and Vigil blankets as gifts between brothers (1976). Also in 1975, arrowman Jon 'Bar' Barbarotto organized our first Cedar Valley Winter Camp. Held annually since, the staff has traditionally been almost 100% volunteer arrowmen. For most of the 1970s, we transitioned to having our chapters conduct Ordeal tapouts and inductions before returning to a lodge Ordeal with chapter inductions in the early 1980s. 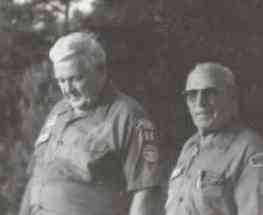 In 1982, Jack Roy retired from Scouting. Later that same year he became the first inductee into the Hi' Lo Ha Chy' A-La Hall of Fame. Little had Jack realized that he would spend 34 years in our council, much less as our lodge professional advisor for nearly the entire time. At the end of summer camp, July 10, 1982, many former staff and campers gathered for a special day to recognize his service. The day concluded with a campfire for Jack, (at left being escorted to the circle by Doc Walker.) His leadership and friendship to countless scouts and arrowman are a continuing legacy in 'cheerful service' through their own service to others, in our council and across the country. In 1984, Jack also received a lifetime lodge membership, the first granted. In 1986, G.W. 'Doc' Walker received the second lifetime membership followed by the third (and last, to date) to Donnie Belk. On November 1, 1982, Brad Gallop assumed the professional advisor role of our lodge. Brad was one of those many youth who grew up in scouting in Eastern Arkansas at Cedar Valley and the OA, having been a lodge chief, before becoming a professional scouter in 1980. Brad continued in this role until his transfer to Tyler, Texas, in 1987. At the 1986 National OA Conference, it was announced that Brad had received the Order's Distinguished Service Award - the ONLY one awarded to any member of our lodge. On the evening of January 28, 1989, to commemorate the end of our 40th anniversary year, we held our first formal lodge banquet at Arkansas State University. Over 340 members, past members and family turned out for what has become an annual event. Jack Roy gave the keynote address provoking a continuous series of laughs and rememberances as he recapped our history, as well as his role in the founding of Lodge 399, in his own special style, ending with his trademark staff story, The Dogs Had a Meeting. The event was also marked by the largest gathering of Lodge 413 chiefs ever. Chiefs Don Hearn (1953), Jim King (1962), John Phillips (1969), Dean Massey (1973), Charlie Harris (1974), Stephen White (1975), Brad Gallop (1976), Kurt Massey (1978), David Shewmaker (1980), Greg Spence (1983), Jeff Puryear (1987), Jesse Cartwright (1988) and Joseph Kueter (1989), were present for the event. The three surviving original Vigil inductees were also present; Jack Roy, Dr. Sonny Roberson and Don Hearn. 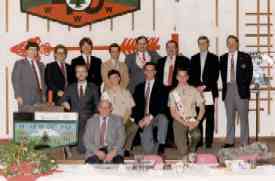 The 1990s saw rapid change in many areas of Scouting and our lodge / council was no different. Twice we have lost old friends during this period. 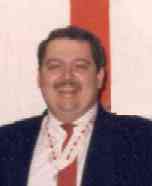 First, with the untimely death of our Council Executive, Ken Ackeret on June 6, 1991; and again on February 23, 1995, with the loss of Brad Gallop while serving as a District Executive in Texas. The face of Scouting has changed too, with many more women involved in positions of leadership than ever before. While, many of these ladies have been active for several years, there were relatively few involved in the non-Cub Scouting programs in our area until the 1990s. In 1996, from this ever growing important early group of female leaders, we inducted the first to the Vigil Honor in our lodge with the elevation of Thelma Kelly in September of that year. Hi' Lo Ha Chy' A-La lodge 413, marked its' 50th anniversary in 1998. Many of our early leaders are gone, but the ideals and principles have remained. Following the merger of our council into Quapaw Area Council, Lodge 413 merged December 31, 2002, into Quapaw Lodge. We continue to serve the youth of northeast Arkansas as members of Quapaw Lodge, striving to develop future leaders using the focus and principles founded in our early years and matured in our years of existance. Many of the ideas and innovations introduced in the 1950s to 1980s have became important traditions to our members. Some have been exported to other lodges around the country including Quapaw Lodge. At the same time, we continue to develop new and different ideas. Just as those 'new ideas' of fifty years ago have become important traditions to us, the new ideas of the youth of today, will surely be our traditions of tomorrow. As it should be, "What is Past, Is Prologue" - only the most recent steps in a continuing journey of cheerful service. Can you add to the story? If you have been a member of our lodge in the past do you know stories or event details that might be of interest to our members? Do you have photographs or old documents that we might borrow? We would truly enjoy hearing from any of our past members. In developing the story of our lodge, we recognize that there are many stories, events and aspects of our history that we have been unable to cover. It is never too late to "Do a good turn", and share your memories with our youth. Please contact the webmaster if you can help in our ongoing project to understand our past. Thank you!